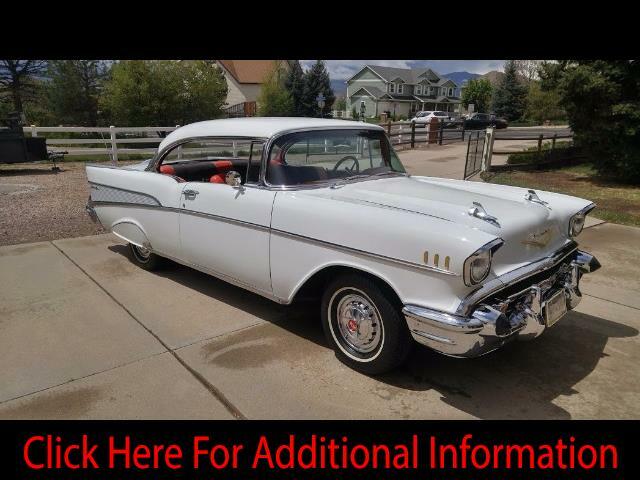 1957 Chevrolet Bel-Air 2-Door Hardtop Modified-Full Off Frame Restoration, 383 Stroker Motor 400 HP-Only 3,148 Miles, 4-Speed Auto 700-R4 Transmission, Tilt Steering Wheel, Front Disc Brakes & Rear Drum, Complete Show Car, New Uniroyal Tiger Paw AWP II Tires size 205/75R14/95S with Original Wheels, Duel Cooler Fans, Always Garaged, Full Undercoated Protection and Custom Dash! White with Excellent Chrome Accents and Continental Spare Tire Addition. This is a Beautiful addition to any Collector’s Collection.